Chicken breast fillets bake with a yogurt spice blend for a moist, flavorful chicken. Combine the yogurt, orange juice, scallion, garlic, ginger, garam masala, curry and salt in a bowl. Rinse and pat dry the chicken fillets. Add to the bowl with the yogurt spice blend. Gently turn the chicken over so that both sides of the chicken are coated with the yogurt. Set aside to marinate for 15 minutes. Preheat an oven to 400 while the chicken marinates. After the chicken has marinated for 15 minutes, line a flat baking pan with aluminum foil. Use a fork to remove the chicken fillets and transfer them to the baking pan, gently shaking the chicken over the bowl first to remove any excess marinade. Put the baking pan in the oven and bake for 18 to 20 minutes until the chicken is cooked through. Ours was perfect in 18 minutes, but check for doneness by slicing the chicken open. 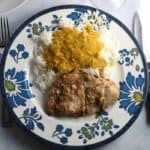 Serve the chicken with basmati rice, and other Indian side dishes of your choosing.